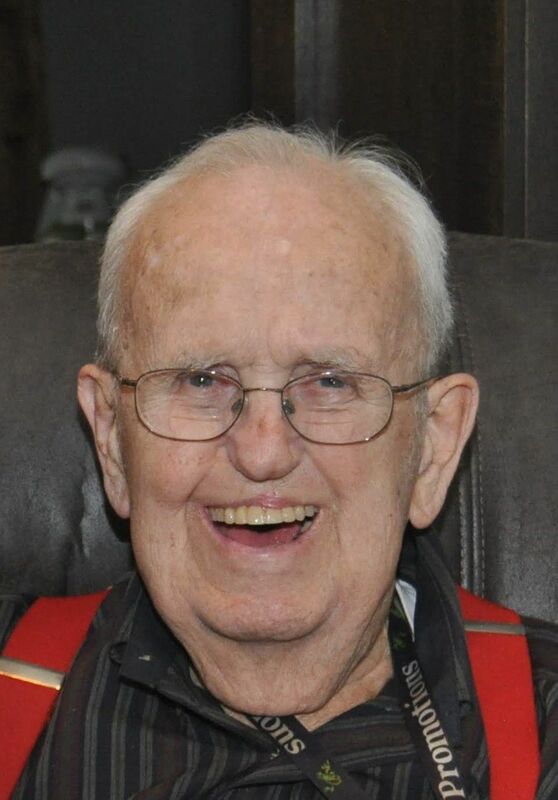 John M. Benedict, 92, passed away peacefully on Thursday, January 31, 2019, at Oakwood Hills Retirement Community. He was born in Minneapolis, MN on April 12, 1926, to Samuel and Hildreth Benedict. As a young boy, John’s family moved to Eau Claire. John graduated from Eau Claire High School in 1944. He went to work for his father at Benedict Sales & Service in 1942. In 1957, Samuel Benedict retired and sold the business to his three sons. Soon afterward, Edward and John purchased brother, Robert’s share. In 1963, John and Edward divided the company with Edward taking over the home appliances and John continuing with the commercial refrigeration. John owned and operated Benedict Refrigeration Service, Inc., until his retirement in 1994. Being a second generation owner, it was always a source of pride that today Benedict Refrigeration Service, Inc., is working into the 4th generation of family ownership. On December 17, 1949, John married Yvonne (Bonnie) Bye. Together they had a daughter, Julie and a son, Tim. John was involved in many local organizations over the years, including Jaycee’s, Eau Claire Builder’s Exchange, Chippewa Valley Technical College Advisory Board and Tyler Refrigeration Advisory Board. However, his passion was to the Shrine as a member of the ZOR Temple. He was a 32° Mason culminating his service as the Potentate of ZOR. He was also a member of the Mehara Shrine Club Drum Corp and was often found marching out of formation and entertaining the crowds. In his younger years, John was a member of the Town of Washington Fire Department. Over the years, John had a love of cars and in one five-year span bought and sold 75 cars. John and Bonnie converted two buses and later had many motorhomes that took them throughout the US and Canada. They were charter members of the Family Motor Coach Association. Retirement brought many years of wintering in Briny Breezes, Florida. John and Bonnie also spent many wonderful summers with friends and family at their cottage on Lake Wissota, Chippewa Falls, Wisconsin. John treasured his time hunting with his son and grandsons. He was well known for his sense of humor and storytelling – John had the ability to make everyone around him smile and was loved by all. John is survived by his daughter, Julie (Lee) Wilcox of Black Mountain, NC, son, Tim (Amy) Benedict of Eau Claire, WI, grandsons, Tony (Andrea) Benedict of Eau Claire, WI, and Luke (Courtney) Benedict of Altoona, WI; great-grandchildren, Emelia, Eli and Asher; step grand-daughters, Elizabeth Wilcox of Madison, Wisconsin and Sarah Borrelli of New Zealand; Sisters-in-law, Marian Benedict and Eva Benedict; as well as many nieces and nephews. He was preceded in death by his wife, Bonnie, parents, an infant (stillborn) daughter, Susan; his brothers, Edward and Robert; his sisters- and brothers-in-law, Delores and Ronald Hillestad and Donald and Mary Bye. Funeral services will be held on Tuesday, February 5, 2019 at 11 a.m. at Spirit Lutheran Church, 1310 Main Street, Eau Claire, Wisconsin, with Pastor Jim Ahlquist, officiating. Visitation will take place on Monday, February 4, 2019 from 4:30 to 8 p.m. at Smith Funeral Chapel and at 10 a.m. prior to the service at Spirit Lutheran Church. The family would like to thank the staff at Recover Care and Oakwood Hills Retirement Community for the wonderful care given to John. In lieu of flowers, memorials may be given to the Shriner’s Hospital for Children, 2025 E. River Parkway, Minneapolis, MN 55414. Family and friends can leave condolences online at www.smithfuneralec.com. Smith Funeral Chapel in Eau Claire is assisting the family.